This is a novelty, isn’t it? For anyone new to my blog, you won’t have a clue what I’m up to, or why. Old friends might just remember the logo. I’ll explain a little later. Jadwiga is a Polish feminine name (pronounced Yad-viga). The diminutive, or affectionate family form, is Jadzia. The name originates from the German Hedwig– hadu meaning “battle” and wig meaning “fight”. You might not realise the significance of this until I tell you about Jadwiga, Queen of Poland. 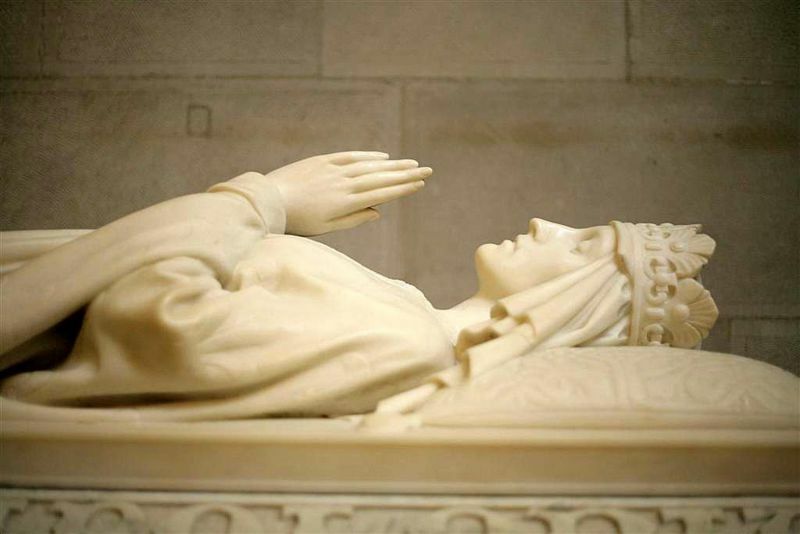 Jadwiga was queen of Poland, or rather “king”, from 1384 till her death on 17th July, 1399. She was a sovereign in her own right rather than a mere royal consort, entitling her to the title of king. 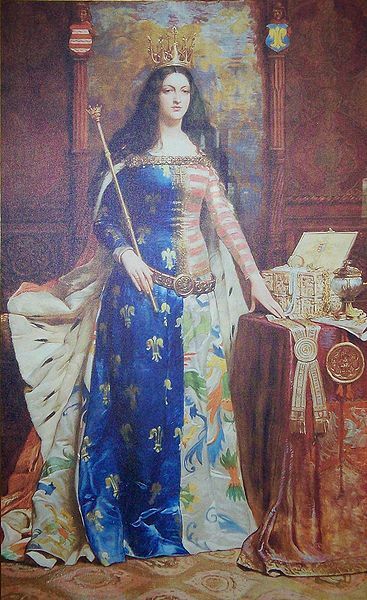 Jadwiga was the daughter of Louis 1 of Hungary and Poland, and Elizabeth of Bosnia. 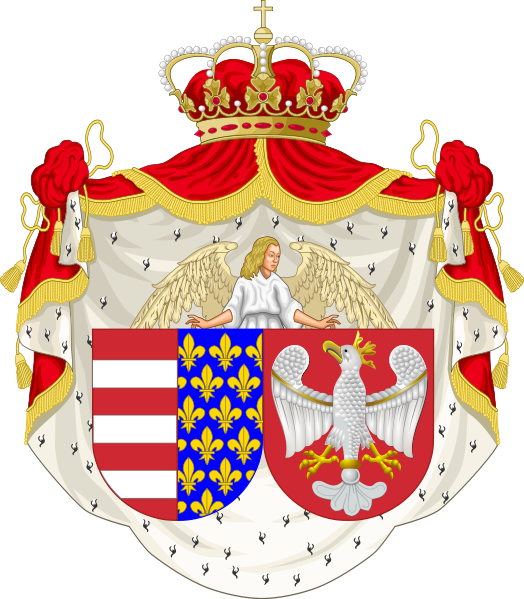 When Louis died in 1382 his eldest daughter Maria was elected queen of Hungary, but the Poles opted to end the union between the 2 countries by choosing Jadwiga as queen. She was then just 9 years old. After 2 years of negotiations with her mother, and civil war in Poland, Jadwiga came to Kraków to be crowned. In 1386 she was married to Jogaila, grand duke of Lithuania, to form an alliance of territories much larger than the one with Hungary, changing the balance of power in Central Europe. The marriage opened the way to the conversion to Christianity of the largely pagan Lithuanians. Jogaila was baptised Władysław in Kraków before the marriage took place, and they ruled jointly, but with Jadwiga as the leading figure. She led 2 successful military expeditions, helping Poland to regain lost territories. When Jadwiga died from childbirth, her husband became Władysław II Jagiello, founding the Jagiellonian dynasty. Jadwiga was a great patron of religion and scholarship. From the sale of her jewellery she financed the restoration of the Kraków Academy, which became the world renowned Jagiellonian University. After her death, Jadwiga was venerated throughout Poland as a saint, and was said to have performed miracles. Details of these and more of Poland’s convoluted history are to be found in the above links to Wikipedia. She was finally canonised by Pope John Paul II in Kraków on June 8th, 1997. And now to my personal interest in the name Jadwiga. Time to meet my lovely cousin, Jadzia. She is one of the daughters of my Dad’s older brother, Zygmunt, who died just months before the family were reunited, and so was never able to greet him on his return to Poland. I have recounted Dad’s wonderful story in Exploring the Polish Connection, and have already introduced some of my cousins in this A-Z series. 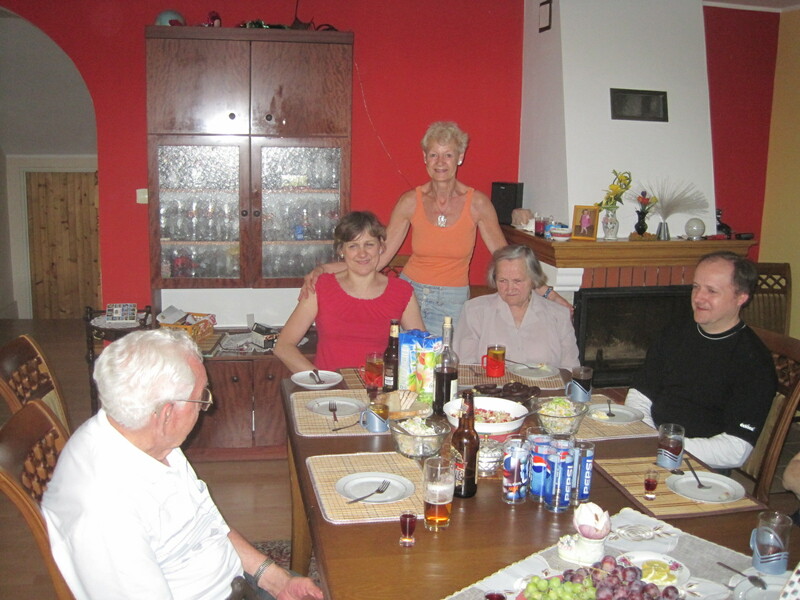 I have many times sampled Jadzia’s wonderful hospitality, and been present at the weddings of both of her children, Ania and Krzysztof. On each occasion our time together has been too brief. Jadzia has a little English and I have a very little Polish. When we exchange emails we do so in our native languages and leave the other to puzzle out the meaning. Ania is fluent in English, and of course, my Dad is an old hand at Polish. In writing this post I am linking back to the original A-Z Personal Challenge begun by Julie Dawn Fox. Life has overtaken me a little so I’ve been slow in reaching completion. I have pages dedicated to my A-Z’s, both for Poland and for Portugal, at the top of the page, so you can see just how far I’ve progressed. I would also like to enter this post in Frizz’s A-Z. I have his permission. When I began this challenge I hadn’t even “met” Frizz. Since then he has enhanced my world enormously. Aha, there she is 😀 And as gorgeous as the lady king! I’m really happy to know that 🙂 I hope you get there some day because it’s a lovely country. Life’s strange, so you never know. Ventis, sometimes I am very dumb! In fact, most of the time 🙂 I get lost in the beauty of the words and in puzzling them out, and forget all about our wonderful world of Google. I’m very “old school” sometimes. and over here it is rain today! Thank you for sharing the fascinating history of Jadwiga, Queen of Poland. 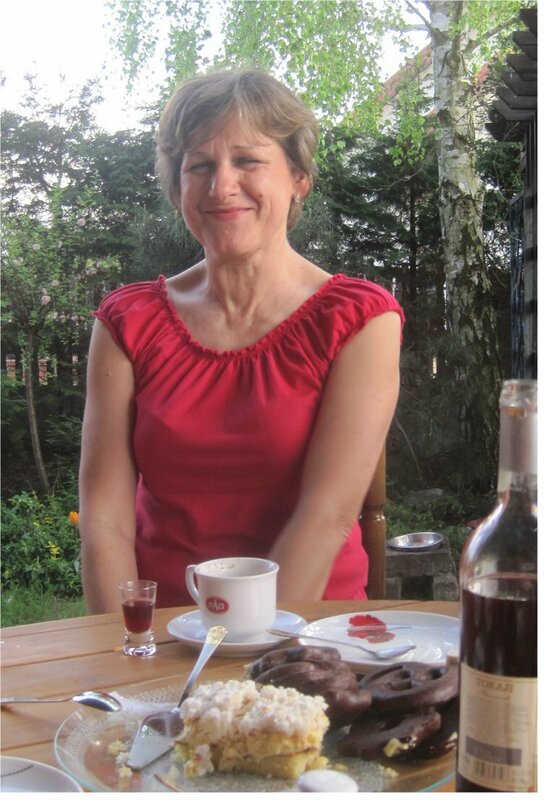 I have a good friend at work, who came from Poland, occasionally, she tells me about Poland and her family in Poland. It is a beautiful country in my experience, Dietmar. I have only been visiting for six years but the warmth of my reception has always been amazing. I thought you might have missed it when I saw your post this morning 🙂 Just to speed you on your way. Say hi to lovely Krakow for me. We leave first thing tomorrow morning, and can’t wait to see Krakow and Wroclaw. Fascinating history lesson, dear Jo. And lovely to meet your cousin here too. The 26 cousins could fill the A-Z, Izzy 🙂 They’ve been a source of amazement to me. Many thanks. Thank you for this post Jo 🙂 You are starting to think like me ;). I was always impressed by women in power. I appreciate your etymology research. My grandmother’s name was Hedwiga 🙂 though she fought in silence all her life. So you are Polish by your father’s side (I wonder what your maiden name was). Is your mother English? I am always appalled at the deal they had when I read history.